The mobile gaming specialist has found a winning formula. Glu Mobile (NASDAQ:GLUU) has set the stock market on fire this year with a string of solid quarterly results. The stock has doubled year to date. The mobile gaming specialist is now at multiyear highs after a strong showing in the second quarter assured investors that a change of strategy that was initiated last year is working. Glu is reaping the benefits of broadening its mobile gaming portfolio into more genres and tapping characters from popular culture. But mobile gaming is a fickle industry where trends can change at the drop of a hat. Still, investors can count on Glu Mobile to sustain its impressive growth, as it seems to have struck the right formula. Glu has already been a victim of the changing trends in mobile gaming once. The company hit gold in 2014 with Kim Kardashian: Hollywood, with the celebrity's popularity helping boosting the company's top line by $150 million during the title's first year on the market. But Glu's fortunes turned as the game's popularity waned, and the company realized that it needed to do more than just rely on fads to grow its business. The good part: Glu has learned from its mistakes. It now has a diversified gaming line-up with different genres, ranging from sports to entertainment to fashion to simulation. More specifically, the company has split its titles into two broad categories -- growth and evergreen -- so that it's clearer which games are doing the heavy lifting and where the company should be spending its money to fuel growth. Growth games are those that are driving the bulk of Glu's bookings (the amount spent by users within games on virtual items). There are three games that Glu currently counts as growth titles: Tap Sports Baseball, Design Home, and Covet Fashion. These accounted for 76% of Glu's bookings last quarter, compared to 60% in the year-ago period. Skeptics would argue that Glu's top line is being driven by just these three titles, but that's because it has singled out these games as potential winners and has invested in them accordingly. The three games generated $50 million in bookings during the prior-year period, and that figure has now gone up to over $75 million. For instance, the Tap Sports Baseball franchise saw a 48% annual increase in bookings after the game's 2018 edition was launched in March this year just before the beginning of the second quarter. Glu made several improvements to the franchise this time around, including player customization, the ability to predict the results of real MLB games, and console-quality graphics. Glu is looking to build franchises that will be cash cows over the long run. This ploy has worked well so far, which is why the company is now looking to add more franchise-centric games based on popular properties, including World Wrestling Entertainment and Disney's Pixar characters. Glu expects these new titles to accelerate its growth starting next year. Glu almost wiped its net loss off the books last quarter, cutting it to just $4.4 million from $23.6 million in the year-ago period. In fact, Glu's net loss during the first six months of the current fiscal year dropped to $11.6 million from $46.3 million in the prior-year period. So the company is now within striking distance of becoming profitable, and it won't be surprising if it manages to get into the black over the next few quarters thanks to a stronger margin profile. Glu's gross margin shot up 4.2 percentage points annually during the second quarter, driven by the incremental bookings that its existing games are delivering. There is another advantage of Glu's strategy of launching titles that can deliver sustainable growth: The popularity of its growth-centric games means that it doesn't need to develop games from scratch. Glu can simply update or improve existing titles by adding new features that will help it improve bookings and keep costs low at the same time. 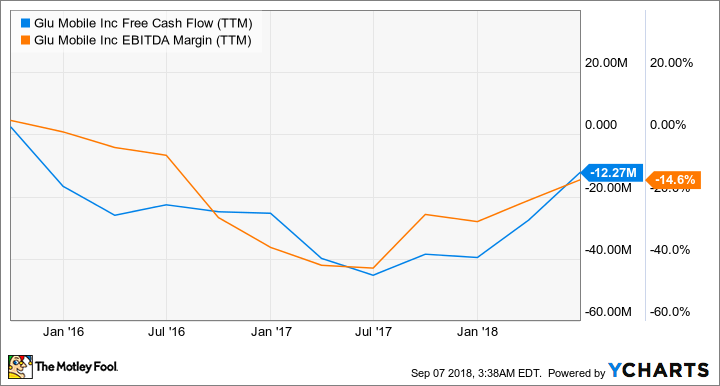 In fact, there is clear evidence that this move is working, as Glu's free cash flow generation has started improving and its EBITDA margin has been trending up. Growth titles as a percent of total bookings are expected to trend upward for the foreseeable future as Design Home, Tap Sports Baseball and Covet Fashion are expected to increase bookings year-over-year, and all new launches are expected to be growth titles as well. It is this stacking effect of year-over-year growth from these current and new growth titles that we believe will help us generate meaningful bookings growth and adjusted EBITDA margin expansion. All set to level up! Glu eventually wants to achieve an adjusted EBITDA margin of 15% to 20% when its annual bookings hit $500 million. The company has generated just over $350 million in bookings over the past year, so it is not very far from its target. The launch of new titles should help Glu Mobile cross that line, and it will eventually become a profitable mobile gaming business. This is probably why analysts are anticipating annual growth of 15% in Glu's earnings over the next five years, setting the stage for more upside in the stock price.